Achieving Your Ultimate Goal in a Fast, Cost-effective, and Reliable Manner. 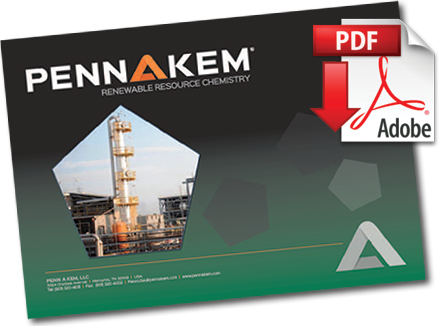 Pennakem is well-equipped and highly capable of executing a wide variety of hydrogenation projects. Pennakem’s line of bio-based products provide performance benefits in our customer’s products & processes. What started as recovery of Furfural from agricultural residues has transformed into a broad portfolio of fine chemicals used globally to enhance our customers’ end products and processes. Along with the development of this product portfolio, a unique expertise in hydrogenation, fractional distillation, oxidation, reductive amination, and heterocyclic chemistry has evolved. In addition to starting with sustainable raw materials, sustainability is at the forefront of Pennakem’s process design. Many of the processes are operated in the absence of solvents. If solvents are required for process efficiency, solvent recovery and recycling is designed into the process. Catalysts in various processes are recovered and reclaimed. Hydrogen is cheaply generated on-site in large volume and at high purity. Pennakem can help you meet your performance and sustainability goals with our broad portfolio. We look forward to adding new sustainable molecules to our portfolio to meet your needs.